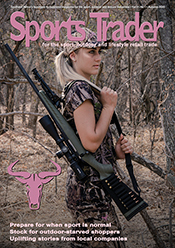 Hunting and sport shooting is becoming massively popular, as the more than 40 000 visitors to HuntEx 2014 demonstrated. This annual consumer show, which focuses mainly on firearms for hunting and sport shooting, last year attracted more than double the 19 000 visitors that attended the inaugural show in 2011. Over the past five years, attendance at this show has grown on average 30% per year. And the organisers expect this growth in popularity to continue at this year’s show, held end of April (after we had gone to print) and therefore expected that 40–50 000 consumers would this year view the latest products from the 346 exhibitors. In addition, smaller HuntEx shows have been held in the Western and Eastern Cape later in the year. Although it is mainly an agricultural show, suppliers and retailers of outdoor and hunting equipment, clothing and footwear queue to exhibit their wares to the more than 70 000 farmers expected at this year’s NAMPO Harvest Day just outside the Free State town of Bothaville. The 650 exhibitors at this year’s show, held 12-15 May, expect to attract far more than the nearly 70 000 visitors who attended last year, if the growth trend of the past 40 years continues. More than 100 000 potential retail customers will therefore be attending these shows in April and May this year. To put it into perspective: if you had to attract the same number of customers to a store, the number of visitors to HuntEx equals more than 100 customers every day of the year, and NAMPO represents the equivalent of more than 200 customers per day throughout the year. Retailers we contacted therefore agree that the popularity of shows like HuntEx and NAMPO are an indication of a growing interest in hunting and related products from consumers. But, do these shows have a positive or negative impact on the shooting and outdoor retail industries and their suppliers? HuntEx is a good opportunity to remind a very large number of visitors what you supply and introduce them to new products, Rescomp Handgun Technologies (RHT) found. Visitor interest is such that an exhibitor can usually recoup costs on the first day, and just generate profit the next two days, they found. Awesome Tools is a veteran of both these shows, who have been exhibiting at HuntEx for more than 15 years (since when it was still the WILD show) and NAMPO since the show’s introduction, says MD Bruce Woodroffe. These shows enable them to interact with consumers and allow them to showcase their products, which generates plenty of interest in their brands. They have had a Leatherman service stand at both shows where they offer repair services to existing customers, which attracts many of the visitors. With nearly double the number of visitors, their stand at NAMPO is usually much busier than at HuntEx. Lite-Optec is also a long-term exhibitor at both shows but on their retail customers’ stands, not under their own name. “We believe that the interest generated is massive and we find both shows to be a great platform to launch new products and educate the consumer on existing brands,” says Kim Romanis, who further believes both shows are worthwhile because they get the chance to interact with consumers and spend time working closely with their key clients when they exhibit on their stands. While consumers think products are more affordable at the show, they do buy the same products from retailers after the show, he points out. Through HuntEx his shop has attracted new consumers who would approach him with an inquiry based on what they saw at the show. “We always experience a positive impact after the show as the consumer would see something at the show and now wants it from his nearest retail shop. I do think that more sales are generated at by the shows,” he says. Van Huyssteen has never exhibited at HuntEx and NAMPO shows because his business is too small, but he visits the shows on the open day to meet with wholesalers and have a look at the new products. He expects the semi-automatic rifles to be selling well at this year’s show(s). Such shows have been good for the industry, as they have attracted newcomers, says Gerhard van Rensburg from Wildman Hunting & Outdoor Western Cape. When he exhibited at HuntEx in the Western Cape, the show gave his business an opportunity to attract new customers, who visit the shows because of the new products on display, all in one location. “Consumers do purchase new kinds of products at the shows, but they also buy products that will normally be purchased at the store,” he adds. Scopes and firearms, especially for hunting, have been the most popular products amongst show visitors. Not everybody, however, believe that the shows have had a positive impact on their businesses — although even the critics visit the shows to see what’s new in the industry. The main complaint is about discounted specials offered at the shows, which results in retailers waiting to place orders before the show because they are waiting for the discounted products at the show, some suppliers found. “I think the shows have turned into a flea market and they set sale prices that cannot be maintained under normal market trade,” says Larry Bester from Safari and Combat Arms. “Shows do have a negative impact on the industry, because customers flood these shows to get the specials from the suppliers and then the suppliers do not have enough stock for the retailers,” agrees Fanus Venter from Die Lapa Wapens. Venter believes that consumers mainly attend these shows with the hope of getting good specials. His company has not been exhibiting at the shows because he believes as retailers they cannot compete with the specials wholesalers offer at these shows. He does, however, attend the shows as a visitor to see if there is anything new and interesting to stock in his store. While he agrees that the popularity of these shows indicate the growing interest in hunting and related products, he believes these consumer shows have “definitely” had a negative impact on his sales. Flora Guns has only once exhibited at the HuntEx show — a long time ago, says Leoni Nel, who believes that the shows affect them negatively because of customers expecting discounted prices after the shows. She does, however, attend the show as a visitor to see what’s new in the market. Did hunting revive the retail trade?